Hey guys! I made a friend yesterday. Meet Rosarie Penaflor. As you can see on the video, she's vying for the next Electrolux Wokaholic Superstar. Now when she'll be doing for the next few rounds I'll be the one to cook with her. She's bubbly and so enthusiastic in person and we kinda were paired because of that. (Yes unfortunately I'm that fun to be with too haha) and what makes me impressed the most is that she's also like YOU and ME. We cook with the same reasons, we do it for family and friends. The thought of me cooking in the competition honestly scares me a little but I want to also do it because I'll be helping a new friend in the process. Wouldn't that be nice to start off a friendship? 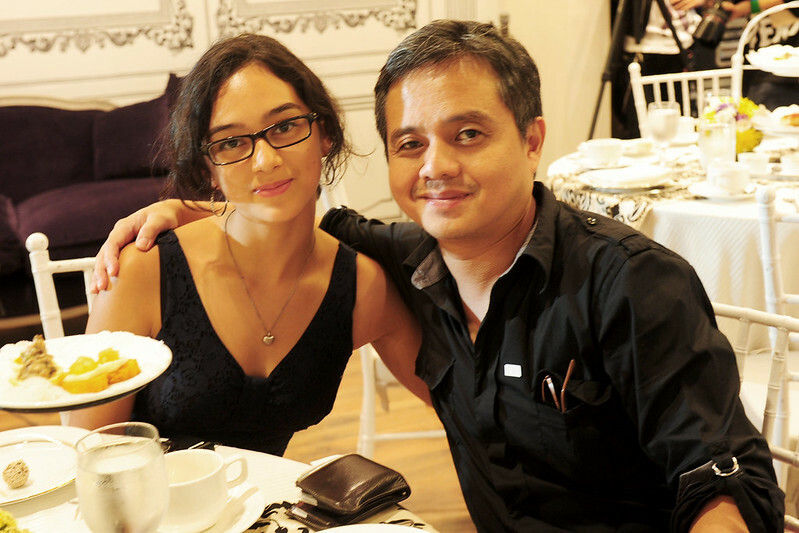 Rosarie Penaflor or Ria as what most of friends call her is a mother of 2 and very happily married. This is actually her first time to ever join a contest and she's loving it! She loves reading, surfing the Internet to get the latest recipes off sites and videos. She doesn't have a favorite dish in particular but just as long as it's good then it would be LOVE! These days she's gearing more into Mongolian, Korean and Chinese. She's not that picky but shys away from sweets and salty food because she's on a diet (just like me haha). I don't really ask for favors that much these days, but can I have your help in this one? It's also going to get you some prizes if your name gets picked so you kinda know the drill. Please go to this link first and fill up the form provided, then hit SUBMIT. Then after that hit the BACK button on your browser so you can also LIKE ROSARIE PENAFLOR's NAME there. For those who would not be LIKING her on the application, (Magingat sa trak paglabas ng bahay nyo!) or better yet you will become Ice Cream! (Yung friend ko kanina naging UBE sya!) hahahah. Kroketten: Yummy Affordable Treats Pinoys Would Absolutely Love! Seeing people line up on the stall that afternoon was a welcome sight. This is apparently their 13th stall and is still in its "infancy" but hearing the rave reviews from people who have experienced it this will surely hit Manila by storm. Imagine soft, delicate potato mash balled/rolled up and breaded, then fried over healthy corn oil, oozing with a variety of fillings you'll surely love. Although I am quite familiar with the French croquettes which are common sightings in parties, this new rendition of an old favorite is a welcome treat! They also explained to us the snack's Filipino twist and how this came about because these things probably would only come in a few flavors if they followed the Dutch standard. They had to make sure and study the Filipino palate, adapt to it and create a totally different line of flavors which we would appreciate. When this snack was being brought back from Ms. Maribel Bosch's trips from the Netherlands. She always brought boxes of these and sent them as pasalubongs whenever she can. Being a Mom and and entrepreneur wasn't easy. She felt people would really appreciate things like these so when she got the chance to put up something in her kid's school, she went ahead and got this sold. The acceptance was so overwhelming that she knew she had to make this a business. I was really worried about the "very cheap" price point but she insists it should be this way because she wanted it to become affordable. I couldn't agree more. The scrumptious creations came in Original Kroket, Kroketballen and Miniballen versions. I love the Kroketballen because of its perfect size and variety it came on. Aside from the Cheese, Chicken and Beef Fillings, you should also try the variety of sauces that they have for the Krokette. I specifically love the spicy paprika based sauce so make sure you try that out. They don't even think of holding back in ingredients so it was so nice to catch these concoctions on its rawest form. There are also not so sweet fresh fruit juice mixes that I so envy them about. The one with the Vers en Snel label on it was so nice I had seconds. It tasted mighty good and comes in Mango-Guyabano and Strawberry-Passion Fruit flavors. It was so awesome to see the owner that evening too. She was so warm and inviting. She made sure to have come up to each and everyone of us to cater to our questions. You really feel her passion for food and why she's so enthusiastic about getting this to the market. Best of all she's sharing this out. Her franchise fees only costs 50,000 pesos, with and 195,000 peso +VAT investment you can start your own branch anywhere in the Philippines. 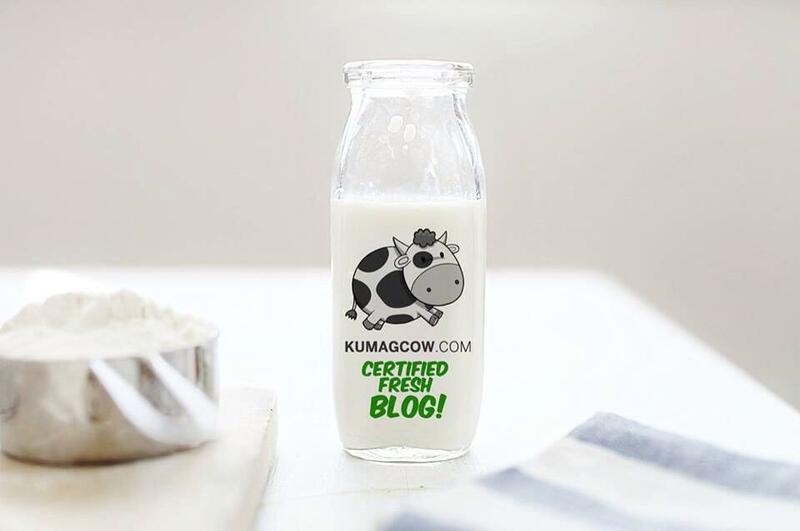 Although the product remarkable gets a quick ROI they still pegged it at a very low rate. I wouldn't be surprised if I get one of these for my own soon. For those who want an affordable thing to invest on, you can be a part of the growing Krokketen franchisees so just contact 6343717, 6340686, or 5027665. Mobile number 09175025006 or simply email ufranchise@gmail.com or visit their website www.u-franchise.com.ph or www.kroketten.com.ph. This might be the best thing to do now that you are earning! I party a lot. 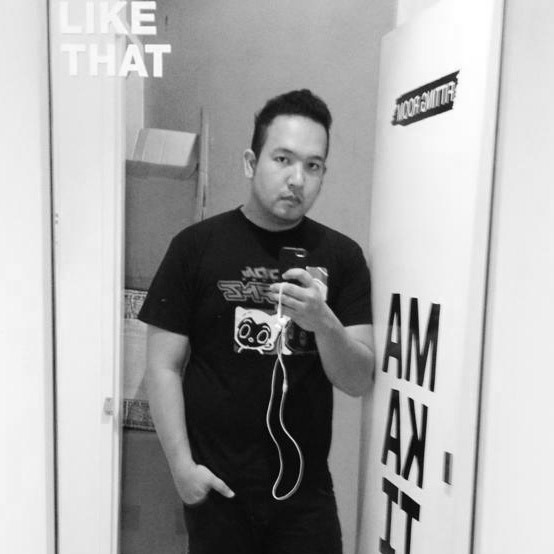 But OH BOY did BigFish Manila change what my concept of parties is! I was able to attend this year's INNOVATION WHITE: BigFish Manila's Annual White Party with European superstar DJ's on the list. I loved it so much that it deserves some photos on my site so you guys can envy me a bit! Haha! It rained white confetti and blue lights last night. It was so nice I felt nostalgic after the event. It was pure House and Trance that night which TOTALLY made me close my eyes a couple of times. I enjoy music when I do that. Best of all, I got to also ask some questions to these gorgeous people here! Myon and Shane54. The powerful Hungarian super humans who make trance music like butter on toast. This duo of DJ/Producers can turn up the crowd whip up a tune and get them wild! I was able to witness part of their set and by my standards it was mind blowing. If I really had some place to be in Europe I'd probably frequent these guys gigs for sure! Cosmic Gate gave me goosebumps. Imagine the venue shutting down some of their lights. Countdown ensues and then suddenly a whole storyboard, plus fireworks and tons of lights come streaming throughout the World Trade Center. It was so awesome! They played their previous hits and made some new mixes that evening. I lost my voice the next day because I was screaming along with thousands of people who LOVE their music! I will surely go and look them up when they are in the country. They were really a nice bunch of people. Thank you so much BigFish Manila for bringing these awesome talents to Philippine shores. I will surely go to the next Innovation White party. I heard the Black Party is next, now that's gonna be something to look forward to! Here are some shots off the actual party. The crazy, talented BOBINA spinned first. It was like RUSSIA took over the Philippines in one go! This was the part where I was telling you about Cosmic Gate a few paragraphs ago. Just look how awesome those lights are, it shone on us while clad all white! Thank you so much to the gorgeous people behind Innovation White and BigFish Manila. You are THE one and only authority in throwing parties. Awesome world renowned DJ's in one place... a party that we surely could never forget! See you on the next one! 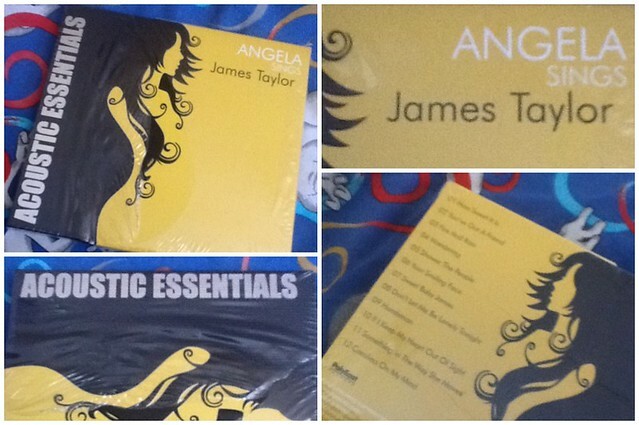 Acoustic Essentials: Angela Sings James Taylor, Michael Learns To Rock! I've been listening to her CD these past few days and honestly I haven't seen this particular artist yet nor have I interviewed her. The album itself didn't contain her photos so I was wondering if this was really meant to be this way. 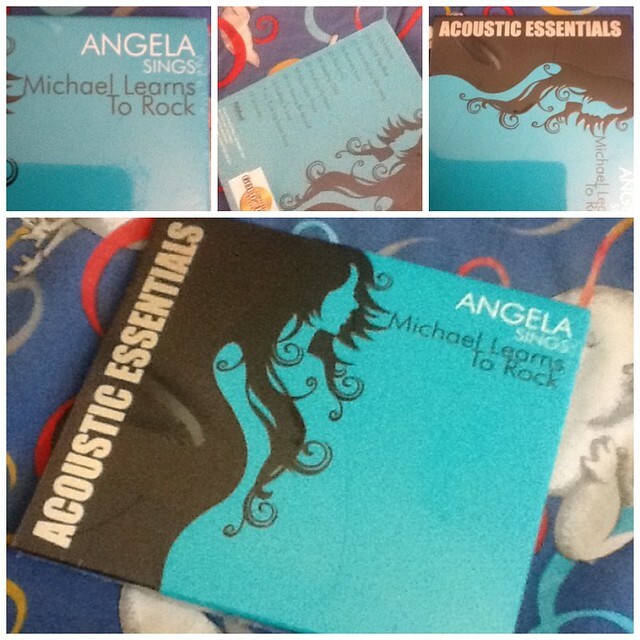 I got her "Acoustic Essentials: Angela Sings James Taylor" and the other one "Acoustic Essentials: Angela Sings Michael Learns To Rock". Both of these artists are classics and I am very familiar of their songs; I wonder how she'll be able to do this since the songs are pretty good even without re-interpreting the original. The other album which contains "Michael Learns To Rock" covers is sublime! For those who loved their songs from a couple of years ago, this is definitely a "Must Buy". It really feels different to hear these songs come from a female because as you know the male take on this was kinda romantic. Since she sounds so angelic the difference just makes this a tad better. Not to undermine the original it just sounds clean and crisp when you do this on an unplugged state. If there's something to take note of on this album, it's the single "I'm Gonna Be Around". You can really feel that she's going to be there. The emotions were evidently showing on each track but I loved this one better. I guess to each his own. You kinda get the favorite songs you connect with. Believe me, it's quite easy to do that with her voice. She's done this so good. You have the choice to love more on this album's 12 tracks. Do you find anything that you fancy?! For those who would like me to choose the better one between the two, I'd go for the James Taylor. Though it would really be a more moving experience if you got both CD's on your car. You'll feel definitely better because its worth collecting. On a Sunday afternoon, where you just want to chill and lie down on a hammock whilst sipping on your tropical punch laced with an umbrella on the side this is the perfect accompaniment for that. I wish I could meet the artist behind this album and ask her about the song choices because I feel her. You can get these albums on your favorite record bars. This is also released in the Philippines by Polyeast Records. It was always quite an amazing feeling to see how much we've improved over the years. With the era of fast cars, better airplanes, larger or even grander TV's we can only marvel at these technologies and wonder how these things came about. I might have no fetish with airplanes and cars but the TV has been my buddy since I was a kid. Case in point is this particular model of SHARP TV. When I was a kid and played console games I was actually using a vintage black and white TV and it just didn't really made sense to do that back then when all the games we played were in color. Mom and Dad brought something like this model and got it hooked up with a pretty huge antenna so we can have more local TV stations covered. Our neighbors even went to our home and watched TV from outside. Honestly, this was a luxury at that time but we were just lucky to have one early on. It lasted a couple of years and for what its worth it has served us well. The purchase was worth it and if it weren't for the thunderstorm/lightning that struck our house at that time this particular TV would have managed to still work. The craftsmanship is impeccable and nobody in the right mind would have said otherwise. I loved our first color TV and kept it a few more years because I felt people from this side of the world can still fix that. If it weren't for Mom telling me to get a new one I would have still opted for that small guy since it fit perfectly in my room. I even remember SHARP becoming one of my technical pencils in college; and they gave me good grades in that too! Did you know that SHARP is celebrating its 100th year? No joke! I didn't even know that its been that long. Reading off the history of the company it started September 15, 1912 when Mr Tokuji Hayakawa established a small metal work shop in Tokyo, Japan. He was young back then and even at that age he was able to harness a variety of patents and got the ball rolling to make the brand one of the most distinguished technologically adept companies in the whole world! Now in this momentous occasion, how do we celebrate with Sharp 100 Years? Well that's easy! You can simply join this contest which SHARP is doing for those who would like to celebrate their anniversary with them. Just go to https://share.sharp100years.com/ and simply post your own anniversary photos or videos. Wouldn't you want to have a trip to the US West Coast and more? Do you know that your entry can also be made into a film? That's exactly what they are going to do if you are chosen as the Anniversary Share II Winner from SHARP. They've got our country included and since we've been one of the world's best sources for photographers/videographers this would be so easy for us I'm sure of that! Because Anniversaries are worth celebrating with SHARP's 100 Years! Since I'm a photographer too, I'll be sending my best photo in the contest. For my buddy photographers out there, are you up for a challenge? Then this is going to be worth the trip!Congratulations also to SHARP for your 100th Year! Sharp continues to improve the quality of people's lives through the years by using the best technology available and its commitment to make innovative products, maintain the quality of it but still think about environmental protection, its value and design. You deserve a few hundred more years in the business! Greet them also by using hashtag #Sharp100! Hi guys! As you may have noticed, my site is undergoing some changes. I am gunning for a more "minimalistic" but functional look. I'm trying to make this site a little fresher than the usual. Cleaning up is a hard job so it might take me a few days to put in all the codes and stuff. Please bear with me, thank you! It might have been one event that I missed but it won't be something that I won't cover. 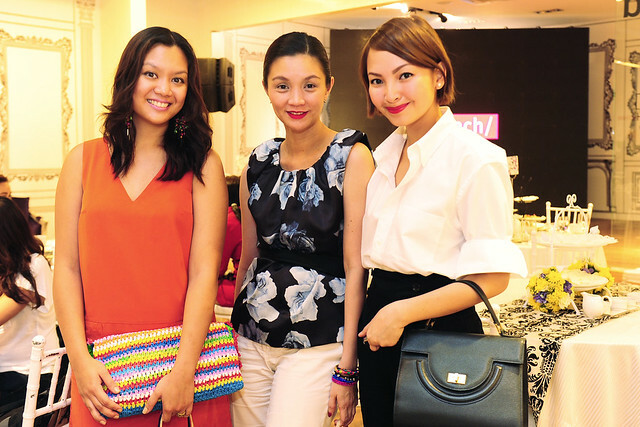 We got these gorgeous photos from Bench showing the highlights of the recent Daphne Home Scents launch last June 8, 2012 at the 2nd floor of Dimensione High Street Bonifacio Global City. It was a very posh tea party complete with white Tiffany chairs, pastel colored flowers and treats so perfect for that afternoon. It was also the time to welcome Ms. Daphne Osena Paez to the Bench Family. We've been seeing her in shows recently that has inkling to design, home and architecture. Unquestionably, she has been one of the style icons synonymous to things that are chic, of glamor and refinement. She's also got her furniture line carried now by Dimensione which in my opinion is so long overdue.Her Daphne Chair now is being regarded as a must have for every girl when they decorate rooms or plainly jazzing up an existing space. The whimsical play on color inspired by her kids evidently influenced designing these pieces. I saw some familiar faces in the event. Spotted some celebrities, writers, bloggers, executives from Suyen Corporation and Bench. Ms. Daphne Osena-Paez and Ms. Amina Aranaz-Alunan. Ms. Alunan is the person behind the famed Aranaz line of bags. She also graduated with honors from Istituto Marangoni in Milan. Ms. Raquel Denise “Kelly” Galvez Misa and Ms. Patty Laurel. We heard Ms. Laurel is soon going to be Mrs. Patrick Filart! Congratulations! 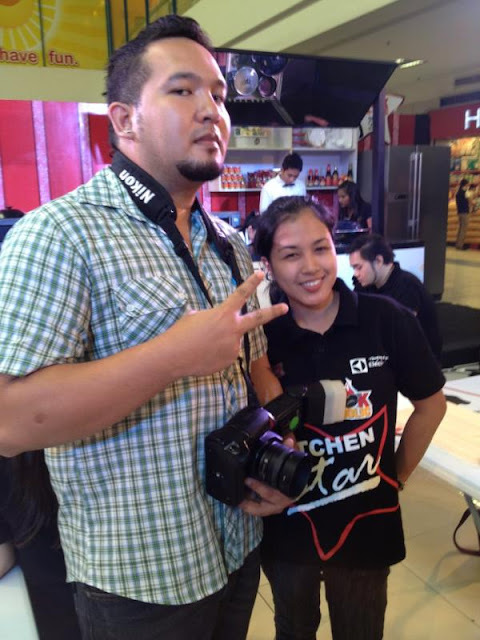 Ms. Daphne with Inquirer lifestyle reporter Alex Vergara. I remember the article he did about Architects a few years ago. Proud to see someone I know was also in the event. 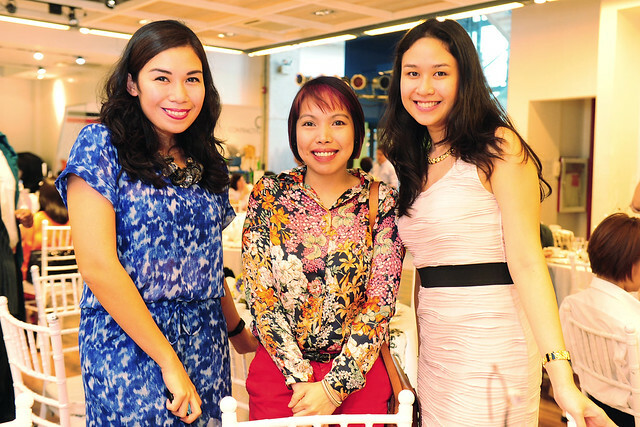 Chic Fashion blogger Angeline Rodriguez (http://wonderwomanrises.blogspot.com/) who consequently also won the Daphne Chair! Now we all envy her! Sweet! Hosting the event was Raymond Guttierrez who I might say looks dapper in his outfit and pulled back hair. They had so much fun doing the tet a tet during the launch of Daphne Home Scents. 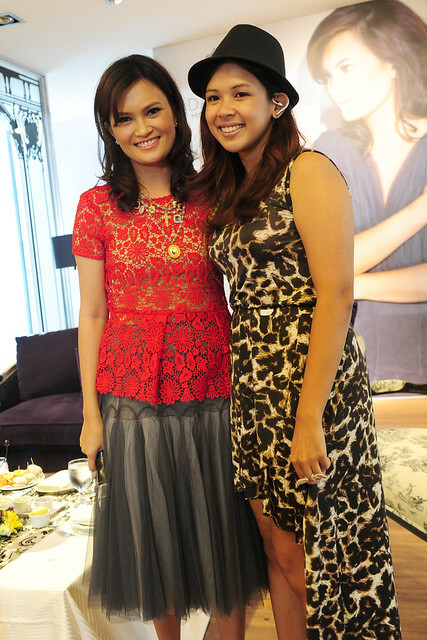 Sarah Irene Tirona of Eggplant's Chronicles (http://www.fashioneggplant.com) and Ms. Kristine Lim the Brand Manager of Suyen Corporation. 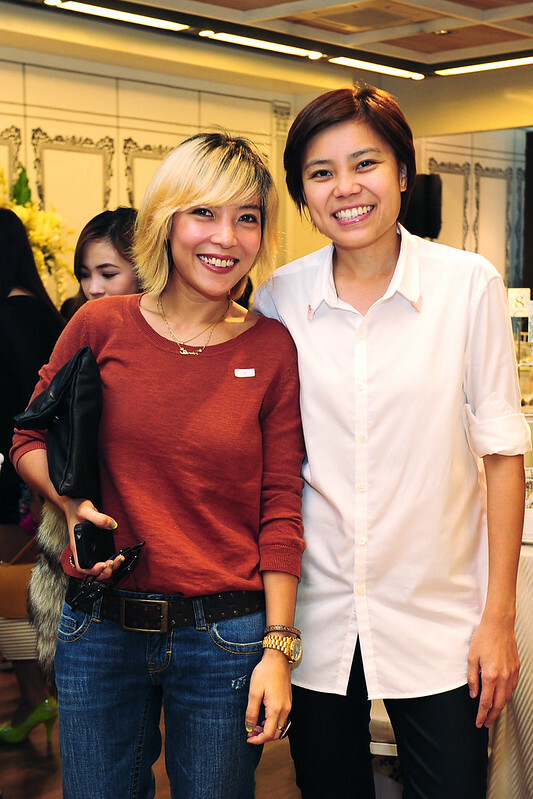 It was so nice to see familiar faces, friends and people from Bench supporting Ms. Daphne Osena - Paez' on her Home Scents launch. If you guys plan to get this, it only retails at 348.00 Philippine Pesos. You choose your own favorites between Acres of Lavender, Homemade Lemon Tart and Mint Jasmine Infusion. 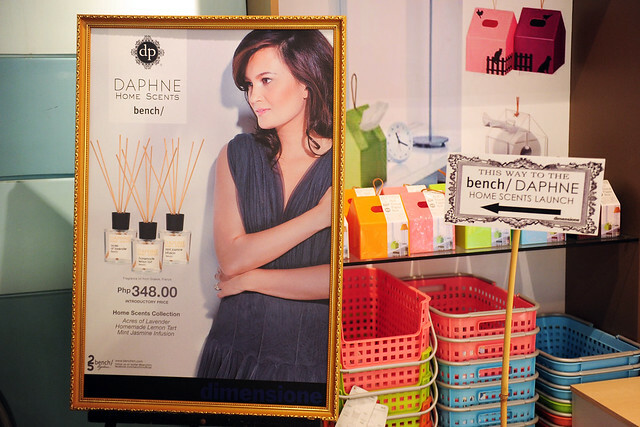 Daphne Home Scents Collection is available at Dimensione stores and selected Bench stores nationwide while the Daphne chair is available at Dimensione Eastwood, Greenbelt 5, Rockwell and The Fort , Bonifacio High Street.